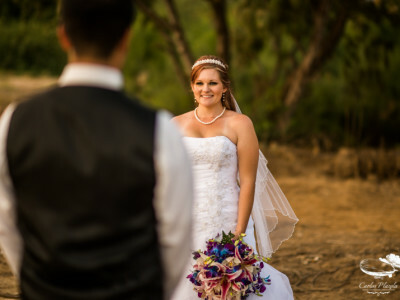 On last February I had the big opportunity to shoot a wedding film in Flora Farms. The place is so beautiful, it has this retro feel, the ambience, the food (which is full organic BTW). It became the perfect spot for Jenna and Tyler to say their bows and seal their relationship. Just looking to both of their faces I noticed how good they were feeling in their special day. I am really grateful of the unconditional trust that Jenna the bride put in all the process, even letting me choose the songs for her. Yesterday the video premiered on their party back at their homeland, and they really had a glad impression with a lot of excitement. The rustic, retro style of the wedding was all designed by Jessica Wolff from Cabo Wedding Services as always keeping focus on every detail. And Minister Marco? As always giving a very emotive ceremony, with a few pranks (oh he is a little devil) which made the ceremony also fun! DJ Mijares with his guitar put the atmosphere needed to relax on the cocktail and the fun vibe with his DJ number in the evening. Hours of coverage: 6 Six.